The Microsoft Surface RT is the brand's flagship Windows 8 device, but does it bring enough to the table to take on its iOS and Android rivals? When the iPad launched in 2010, Google and its army of Android–powered tablets all squared up to the revolutionary device and most of them came up short. 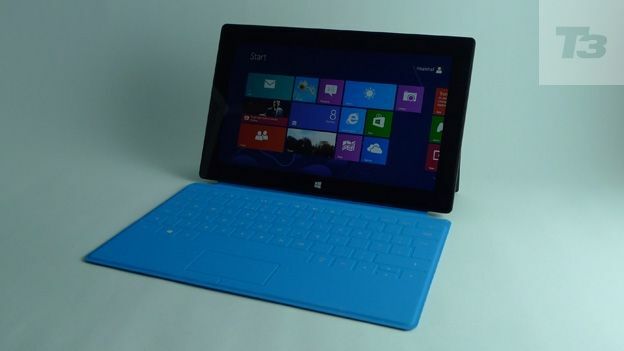 Since then devices like the Google Nexus 7 and Asus Transformer Prime have gone some way to provide a threat to the iPad and iPad Mini and now the Windows 8-toting Microsoft Surface, with its own keyboard, has entered the fray. Microsoft claims the Surface is the answer to all your mobile computing needs, which is some billing. Does it live up to the hype? Is it a tablet killer or a laptop killer? Here's what we made of the Surface. If you're expecting the sleek aluminium curves of the iPad, you're going to be disappointed. The Surface tablet comes in a dark titanium matte black-style shade and has a far more industrial look and feel, but does look built to last and able to withstand more than a few knocks. Using a VaporMg alloy which is three times lighter than aluminium is a good thing because we would hate to think how much heavier it could be than the 676g it already weighs compared to the iPad 4 Wi-Fi (652g) and Google Nexus 10 (603g). At 9.4mm thick it's as slim as the fourth generation iPad, but not as slender as the Nexus 10 (8.9mm). The corners of the tablet are curved making it more comfortable to hold in landscape mode for prolonged times but it doesn't detract from what is a noticeable weightier device in the hand than its closest tablet rivals. There's a the volume rocker on the left edge of the device just below the 3.5mm headphone jack with the on/off button on the top and on the right side a USB 2.0 port Micro HDMI port and the charging port which has a similar magnetic mechanism as the keyboard docking port but is far more fidgety to plug in. There's the kickstand which hides the handy MicroSD card slot which is great, but we do have to take issue with the fixed angle build having preferred to arch the screen a little further when in use. Then there's the Touch and Type keyboard covers which snap into the magnetic clasp satisfyingly to turn tablet into laptop. Well, we say laptop, but only if you're working on a flat surface, because the design is not very helpful to those who like to lie down and type on the sofa or in bed or even on your knees, as you can do with something like the Asus Transformer Infinity or Prime which rather negates the idea of it truly working like a laptop. The keyboards themselves offer very different experiences for typing. The Touch keyboard is guaranteed to divide people as to its ability to write emails and documents quicker than on a traditional keyboard. At a wafer-thin 3.25mm, we found that if you jump from keys to quickly you can easily miss out letters which can be frustrating but if you are willing to put the time we could see the benefits. The Type Cover is a more traditional keyboard experience and while it's not in the same league as the Asus Transformer Infinity keyboard dock, it should serve you well in the typing department. Going bigger than the iPad and most Android tablets, the Surface sports a 10.6-inch 16:9 ratio ClearType HD resolution display which means no, it's not full HD. The 1366x768 pixel resolution and 148ppi is not quite in the realms of the iPad 4 (2048x1536 and 264ppi) and the Nexus 10 (2560x1600 and 300ppi) but it still ensures impressive levels of clarity for video and font even if it lacks the vibrancy and colour of Samsung tablet screens (such as the Samsung Galaxy Tab 2 10.1). It's still a great place to watch movies, browse the web, and accommodate the clean looking Windows 8 user interface. Scratch resistant glass should add further durability to an already well built and strong device. Don't expect to leave the smartphone in the pocket when you go sightseeing as the paltry 1.2-Megapixel rear- facing camera with 720p HD video shooting doesn't deliver photos and video you'd be in a rush to share on Facebook. While the snaps we took absorbed decent levels of light, images showed a considerable amount of noise. The same can be said of the 1.2-Megapixel front-facing camera but with 720 HD capabilities does do a decent job when we put it to the test with a few Skype video conversations. One thing we really liked was the angled design of the tablet which means you can have a clear view of the screen and scene to ensure you get exactly what you want to capture in the photo. In landscape mode, the two stereo speakers are positioned at the top side edges of the tablet keeping them well away from being cupped and muffled by your hands as can be the case with some Android tablets we've recently tested. It produces some of the more impressive audio we have heard on a tablet device but is by no means ground-breaking. You can expect a clear, warm sound that makes it particularly impressive when watching movies on the Surface. We've already run the rule over Windows 8, and with the Surface you can expect Windows 8 RT which is a version of the new operating system that is tailored and streamlined specifically for tablets. What you can expect is the beautiful tiled Windows 8 interface as you glide around Bing-powered apps, IE 10, Xbox Music and Video content and access unified email accounts amongt other things. What you'll also be able to do is access a traditional Windows desktop which, for those who regard the more touchscreen-orientated version of the OS too much of a transition, can still offer that familiar Windows 7 feeling. One of the major pluses is that Office Home and Student 2013 RT Preview is pre-installed, however having to flick back to the desktop mode to use it does create a bit of a confusing user experience. One of the Windows 8 features that we absolutely loved was the ability to snap apps to the side of the screen to create a multitasking environment where you can truly have your eyes on two apps on the same screen. Thankfully this supports all native apps and those available through the Store and executes multitasking more impressively. than the Samsung Galaxy Note 10.1. For a device that relies on its app content, it was disappointing to see how bare the Microsoft Store was for the device at launch. You'll spot some familiar top line apps like Skype and Xbox SmartGlass plus games like Jetpack Joyride and Fruit Ninja, but it doesn't take too long to notice that even the Chrome OS Store has a better app showing. Add in the inability to install Windows 7 apps on Windows 8 RT and it makes it even more of an issue. A Wi-Fi only device with Bluetooth 4.0 support, the Surface is powered by a Quad-core NVIDIA Tegra 3 processor with 2GB of RAM to take care of multitasking and bring it in line with top end Android tablets like the Transformer Pad Infinity and Nexus 7. This ensures that navigating around the tiled interface is lag-free and browsing in IE 10 is pretty speedy with minimal page loading times. The biggest problem we were faced with was loading times. Launching pre-installed apps, games and apps downloaded from the Microsoft Store would hang for almost 10+ seconds before loading or syncing and that was evident throughout our testing on Wi-Fi connections at work and at home. We thought this was an isolated issue but having found others having the same problem with the Surface it seems like there is something under the hood that is not quite working to order. On the storage front you have a choice of 32GB or 64GB versions of the Surface RT which unlike the iPad has expandable storage options via USB and MicroSDXC. It has since been revealed that the 32GB Surface has only 16GB of the room available which is a significant drop in on board storage and pushes more reliance on using SkyDrive cloud storage. Microsoft claims that the 31.5-watt-hour battery should deliver 10 hours of battery time which is much the same as the fourth gen iPad promises with its 43.5-watt-hour battery. Thanks to the quadcore power and not so power-sapping display we managed roughly 9.5-10 hours browsing the web, downloading apps, playing games, watching movies and putting the multitasking features to the test with media rich applications. Is the Microsoft Surface an iPad killer? The answer is that they are two very different beasts. The iPad is a sleek multimedia device that has the app capacity and power that can make it as work-friendly as it is amazing for watching films, reading magazines and playing games. The Microsoft Surface has the impressive keyboard cases, the expandable support, slick Windows 8 UI, and the multitasking prowess that is really a unique tablet feature. However, it's let down by some worrying performance issues, a disappointing screen, threadbare Microsoft app Store, the huge storage space Windows 8 RT takes up and we really think the restrictive design of the Surface only being made for flat surfaces and not lap use is a massive oversight. Full Microsoft Office support is the jewel in the crown of the Surface which along with the keyboard makes it a great tool for productivity, but whether that is enough along with the other notable features to warrant recommending over the iPad or the Asus Transformer Infinity we are not so sure. If you are truly sold on the idea of the Surface, we suggest waiting on the second generation version. Microsoft Surface sales just 1.5m compared to iPad's 23m?